The Kobold all stainless steel pressure gauges are ideal for the hard conditions and the resulting high demands on pressure measurement in production facilities in chemical industry and other comparable areas. Resistance to aggressive media and environments is achieved by using high-graded materials such as stainless steel both for the movement and the housing. They can be used for liquid or gaseous substances which do not crystallize and are not highly viscous. The extensive range of options allows the user to adapt the instruments to his own special requirements. All the pressure gauges comply with general international guidelines and take account of standard as well as application specific requirements. They are the result of the over 70 years’ experience we have in building pressure gauges. These Kobold pressure gauges can be used for all applications where accuracy, repeatability and long-term stability are of special importance. They can be used for liquid or gaseous substances which do not crystallize, are not highly viscous and do not corrode brass. The extensive range of options allows the user to adapt the instruments to his own special requirements. The Jumo capacitive humidity probes have been designed for the most common heating, air-conditioning and ventilation applications. They are particularly distinguished by high measurement accuracy, excellent long-term stability and good chemical resistance. The modern design allows a low cost of installation and offers the greatest possible protection against pollutants and condensation. These factors, in turn, contribute to smooth and trouble-free continuous use. The Jumo LC100 controller is available in 48x48mm format. It is used for two-state and three-state control applications as well as for control of control valves or SCR power controllers through a continuous output of the controller. The universal analog input of the LC100 for RTD temperature probes, thermocouples, or current/voltage signals is user programmable. The set point value, the actual value and all parameters are displayed on two seven-segment LED displays (red/green) with one or two decimal place(s). The values can be displayed in °C or °F. Depending on the format, up to five relay outputs with a switching capacity of 3 A / 230 V or up to four logic outputs 0/14 V are available. The switch position of the relays or logic outputs is displayed using yellow LEDs. Different functions can be assigned to these outputs. An analog output 0 to 10 V or 0(4) to 20 mA is configurable as continuous controller output, actual value output or set point value output. Using the binary input, the device settings and operation can be locked, a ramp or the timer can be activated, or self-optimization can be initiated. The supply voltage is optionally AC 110 to 240 V or AC/DC 20 to 30 V.
The diraTRON is the newest compact universal controller family from Jumo. With 5 DIN formats, controls temperature, pressure and other process variables. The diraTRON are characterized by a simple, clearly structured operation, supported with texts. Process values are represented by two 18-segment LCD displays. The types 702112, 702113 and 702114 are additionally equipped with a pixel matrix LCD display for displaying text. In addition, all devices have individual display elements for the switch positions of the outputs as well as for manual mode, ramp function and timer. The devices are operated using a membrane keyboard with four buttons and can be used under harsh environmental influences thanks to the high IP65 protection type. Due to their compact design, the sturdy flow meters of the DRS type from Kobold, can be used even if little space is available. The measurement method, which uses a sapphire-supported turbine wheel and is suitable for liquid media, is extremely low-wear, since the revolutions are sensed in a non-contact manner by magnets from outside. Based on the high repeatability of 0.1% of full-scale, this reliable measuring device with long term stability is highly qualified for batching tasks. Since compressed air is produced internally in a factory without exact knowledge of its total or area consumption, there is a need to eliminate leaks and achieve much more efficient use. The compressed air counters testo 6441 to testo 6444 are designed for the measurement, monitoring and recording of compressed air consumption, and therefore also for the determination of leakages in compressed air systems, consumption-based allocation of costs and the implementation of peak load management. Using the compressed air counters testo 6441 to testo 6444, transparency of consumption is created for compressed air, similarly as for the media current, water or gas, thus increasing the motivation of those responsible for the process regarding cost reduction measures and energy savings. High performance at an economical price. 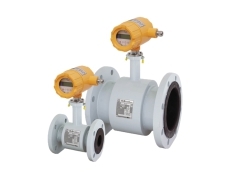 The Kobold TME Series general purpose Coriolis mass flowmeter from KOBOLD Instruments is a very accurate, rugged design built for general purpose mass flow measurements of liquids and gases in most chemical, petrochemical, oil and gas applications. Mass flow, density and temperature are simultaneously measured, and volumetric flow is computed from these parameters. The flowmeter’s wetted materials (flanges and measuring tubes) are available in 316L stainless steel. The measuring tubes and sensors are protected by a very rugged cast iron housing. Kobold all stainless steel diaphragm pressure gauges are preferably used for aggressive media where standard diaphragm pressure gauges are challenged. Diaphragm pressure gauges have a relatively high actuating force. The circular diaphragm is insensitive to jarring or vibration. An extremely high resistance to overpressure is achieved by underpropping the diaphragm. For highly viscous, crystallizing or strongly heterogeneous media, open flange connections are used. The wetted parts are coated by high quality polymers (PTFE/ECTFE) for specific use with aggressive media. Also the used seals are made of PTFE or covered by it. The Kobold flow meter model RCD is used for measuring and monitoring liquid and gas flows. The device works on the well-known principle of the Venturi nozzle. A small pressure difference proportional to the flow is produced by the flowing medium at an orifice constriction (nozzle) in the device housing. The shape of the nozzle is based on the flow, whereby the flow characteristic remains constant over the entire measuring range. Drill holes are located in the housing fitting to absorb the resulting differential pressure and transfer it to a differential-pressure measuring cell fitted in the housing. With advanced microprocessor technology and state-of-the-art silicon pressure sensors, the digital pressure calibrators 672 series precision pressure calibrators from Additel provide a pressure calibration solution for gauges, transmitters, and switches over a wide pressure range. The Additel 672 digital pressure calibrators is a very portable device and can measure pressure precisely with a built-in pressure sensor, as well as read the current or mV produced by a transducer. It can even supply an excitation voltage to power sensors or transmitters during calibration. In order to reach 0.025% F. S. accuracy up to 10,000 psi (700 bar) and 0.1% F. S. accuracy up to 36,000 psi (2,500 bar), every silicon pressure sensor in our gauges has been specially aged, tested and screened before assembly. The 672 series precision pressure calibrators are unmatched in performance and reliability. With advanced microprocessor technology and state-of-the-art silicon pressure sensors, the 681 series digital pressure gauges from Additel provide an accurate, reliable, and economic solution for a wide range of pressure applications. They are loaded with functionality and remarkably easy to use. To reach the best performance, every silicon pressure sensor in our gauges is specially aged, tested and screened before assembly. The 681 series digital pressure gauges from Additel are unmatched in performance and reliability. Best of all, they are very affordable. They are loaded with functionality and remarkably easy to use. To reach the best performance, every silicon pressure sensor in our gauges is specially aged, tested and screened before assembly. With data logging and wireless features, the 680W gauge can store pressure measurement data in the internal memory or display them on PC through wireless communication. The 680 series digital pressure gauges are unmatched in performance and reliability. Best of all, they are very affordable. Induction flow meters/ electromagnetic flow meters are intended for industrial measurements of electrically conductive liquids in different fields of industry. Induction flow meters meet most demanding requirements on accuracy, reliability and long-term stability of measurements. Liquid flow rate measurements in both directions of flow are possible. Induction flow meters of the FLONET FH20XX type series from Elis are intended for professional application and measurement of flow rates of electrically-conductive liquids in water and heat-supply systems, food-processing and chemical industries. They meet the most demanding requirements on high measurement accuracy, long-term stability and hygienic standard. The new compact type MIK magnetic-inductive flowmeters of Kobold Messring GmbH from Hofheim have a variety of measuring ranges and are available in an incomparable range of designs. Measuring ranges start at 0.01 l/min and currently end at 700 l/min. Six different measuring tube sizes from G ½ male to G 2 ¾ male are perfect for users with small to larged-sized measuring ranges. This device series combines the largest measuring range spectrum and the most design options with the lowest market price. To check the flow processes in pipeline systems and for insight into the interior of process pipes, many flow indicators are used in which the flowing medium sets a rotor turning and thus to a large extent visibly signals a flow. The particular thing with the special version Type DAA is that the rotor is housed in a glass cylinder. This version ensures a functional flow check from two points of view. On the one hand its construction as a visible cylinder gives a relatively large and thus easily observed field of observation; in addition the rotary movement of the PTFE rotor permits reliable monitoring of cloudy or dark media due to its noticeably bright colouring. This type of device is already widely used and has proven itself in industrial use thanks to its functional reliability. Inspired measurement technology for small volume flow. With its new DTK impeller flow gauge for small quantities, Kobold-Messring GmbH offers a new versatile, efficient and very economic piece of equipment. This gauge was specially developed for use in low viscosity liquids. It’s very compact construction means it can be used in machines with restricted space as well as in industrial systems. A special advantage of this gauge is its long term stability and robust construction. In the DTK flow gauge the medium flows through a specially formed flow casing thus causing the impeller to rotate. Two magnets on the impeller generate electrical impulses in a Hall sensor. The frequency emitted by the electronics is then directly proportionate to the flow velocity. Downline electronics can use these signals for measuring, monitoring and dosing. The paddle torsional flow meter type DPT from kobold works with practically no wear and tear. A flat torsion spring fastening the paddle provides the elastic force, and forms the basis of the measuring principle. The deflection of the lever arm is transferred through a magnet to a Hall-effect sensor in a non-contacting fashion. This technology has important advantages: the devices operate independent of the operating pressure. Friction loss during paddle deflection causes no switching hysteresis. The rotating vane flow meter type DRH from Kobold can measure flow rates of liquids of low viscosity – and even non-conducting liquids. Thanks to the extensive expertise and experience of Kobold in the field of industrial metrology and a comprehensive selection of specifications, excellent solutions can be provided for a whole range of tasks. The ten measuring ranges extend from 0.2–0.8 l/min to 2.5–50 l/min. Seven different material combinations for case, cover and seal also provide suitable solutions for problematic media. The brass and stainless steel models can operate at up to 100 bar service pressure and at a maximum temperature of 80°C. The rotating vane flow meter DRH is ideally suited for service in refrigeration technology, in mechanical engineering and in printed-circuit board manufacturing. The Kobold BGN meter is suitable for flow measurement of liquid or gaseous products in pipes. It shows the current flow rate in volume or mass per unit in time. The Kobold BGN Series variable area flowmeter functions by the fluid flowing from bottom to top through the meter tube of the flowmeter. The float is lifted until an annular gap between the meter ring and the cone-shaped float is produced which corresponds to the flow. The forces acting on the float are in equilibrium. The forces that are mainly acting on the float comprise buoyancy according to the principle of Archimedes, the flow force of the medium and the weight force. Each position of the float corresponds to a flow value measured during calibration, which is transferred to a scale. The BGN variable area flowmeter consists of a meter tube with connections, a meter ring, and a conical float. By means of a magnet, the position of the float is transferred to an encapsulated follow magnet, which has been fitted to a pointer axle. The position of a second annular follow magnet fitted on the pointer axle is transferred to the scale by means of the pointer. Magnetic level sensors are used for the monitoring and control of liquid levels in vessels and manufactured according to every customer specification. The float sliding up and down on the liquid is the only moving part in the Kobold magnetic float sensors. The flowmeter of the series KMT, based on the measurement principle of thermal mass flow, is ideally suited for the measurement of flow of compressed air and gases in pipes with sizes from DN 15 ... DN 700. Measurement of for instance the usage of compressed air, nitrogen, CO 2 or other non-corrosive gases. The KMT is setting new standards in terms of measurement accuracy and reproducibility thanks to its application specific adjustment during production. 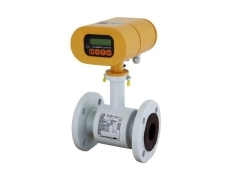 This flowmeter is adjusted under a pressure of 7 bar (abs) (DN 15 ... DN 50) or 9 bar (abs) (DN 65 ... DN 700). Adjusting the device specifically for its application has the advantage of keeping the actual flow speed in the pipeline low even with very large flow quantities. Thanks to the more stable flow profile, this low flow speed facilitates a much better degree of reproducibility and accuracy than if the device were adjusted conventionally under normal pressure, as flow speeds up to 200 Nm/s can often no longer be controlled under conventional adjustment pressures.